I got a little unexpected present this morning. This guy, Ellsworth, who I've never heard of in my life before, sent his CD all the way from America. It came with nine stamps on it, in a pretty pattern on the front. That's effort. I was impressed. I'm much more impressed now that I've listened to it a couple of times. This isn't emo, this isn't metal, this isn't indie, this isn't punk... but it isn't new. Remember all the cliches? The gun-toting, Texas drawl of the country music star? The Dolly Parton voice, the hat, the boots, the damn patronising patriotism of it all? This guy is different. He's good. All-round good. This album made me look at country music differently. Country music can be good. Yes! ...I feel like I'm at some kind of AA meeting, actually... Yes people! Country music can be good! I suspect this will be news to a lot of you. The genre's had some bad press, and I know I was behind some of it. Ellsworth sets new boundaries though. He draws loads of folk into the mix - enough to take the yeehaw! out of his album - and adds meaningful, well-penned lyrics that make you think. From the first song, Ellsworth sets his agenda, and that agenda is to make an absolute blinder of an album. The best thing about this album is that all the instruments have been done by two people. And you can't tell. There are keyboards. You can't tell. It sounds bloody awesome. It's polished, it's completely un-irritating. The tracks all sound distinctive, and I can't actually pick my favourite, because... well, they're all good. This guy knows what he's doing, and it shows. Mind you, Ellsworth should know what he's doing by now. His completely un-pretentious blurb informs me that that he's been doing his thing since the '70s - and the best of the '70s oozes out of this album. The man has a voice that sounds like the owner smokes 40 a day whilst simultaneously eating Cadbury's Caramels. Actually, he sounds a little like Phil Collins, and yet I remain wholly unannoyed. He even mentions 9/11 in the aforementioned blurb... and yet I forgive him. Ellsworth seems to me to be the kind of guy it would be nice to sit and have a pint with; the kind of guy your Dad's not really cool enough to be friends with. Ellsworth sounds like he should be a legend already. In fact, I'm still wondering whether Ellsworth already is a legend already, and that I fell out of the loop or something. The tunes are fantastic - singalongable, lighter-waveable, head-noddable. Ellsworth and chum play super-hot guitar - light, heart-plucking, perfect solos, and melodic backing that culminates in a truly satisfying album. The slow songs aren't over-sentimental, the fast ones are sweet and simple, and there seems to be a perfect mix of instruments. As for rhythm, this album has more than you can imagine. The last track, Madam Freud, has an oddly syncopated beat and a slightly tribal sort of feel - the sort of track that makes you dance around your room in your pyjamas like a little kid watching The Jungle Book for the eighteenth time. It's nearly eight minutes long, and I still can't believe I didn't realise it until I looked on the CD case. I'm not used to writing reviews of stuff I like. I don't quite know what to do. How on earth can I sum up this review? This way. Watch your back, Bob Dylan, watch your back. You can run, but you can't hide. I've always wanted to type that, and now I can. P.S., you can't get this at Amazon - buy it at CDBaby. I really can't tell you how much I recommend this. Buy it for your Dad. Then steal it. Finally someone recognizing a truly gifted songwriter. I have to buy another copy of it cuz my kids have already stolen mine. Really fine review of a really talented singer-songwriter. Yep,joyful and satisfying! I've known this guy personally for years. He played at my wedding twenty years ago. How much did he pay you to say all this stuff? Just joking. He's an awesome individual. I had been thinking about buying the CD. Now that I've read your review (i.e., by someone who doesn't even know him and who lives in Great Britain), I am definitely going to do it right now! I have to say that Ellsworth is a talented musician. I've performed with him in several musical genres whether my score of Laura Belsey's movie "Spring" or be it the score of Ghetto Dawg, performing along side Hicks, Leal or the great Caroline Slim, he always raises to the occasion....just as seasoning accents the aroma of food, he's as adaptable and favorful as your favorite treat. When hearing or shall I say listening to Ellsworth perform his compositions you can easily forget it's his original song, because it JUST MAKES YOU FEEL GOOD and respect the very monment you relize you're alive. Imagining whether or not it's something you've heard because his confidence comes through as the chords are structured correct, the melody is strong, the message is there and his voice is smooth as butter.... and HE CONVEYS THE STORY. The first time I heard Madam Freud I was beautifully wasted. I had the nicest sensual high and the music permeated my skin and soul. Someone was playing drums and there were more guitars, but what I remember mostly is the rythym and Ellsworth's melifluous voice. When I bought the CD I was thrilled he'd finally recorded that tune. I've played it over and over since I got it in the mail. The thing is it's a good song even straight. mad. That just could be the review heard round the world! Couldn't happen to a nicer guy. We actually HAVE had a pint with Mr. Ellsworth, and he's not really too cool for your dad to be friends with (whatever that means) but he is way cool. Doesn't smoke 40 a day or eat Cadbury's Caramels but he can throw back a pint. He is a legend already (but in fairly exclusive circles near his home bases of Brooklyn and Shirley, Mass). And last time we looked he was NOT country (but hey, Brooklyn ain't exactly Manhattan, if you know what we mean). 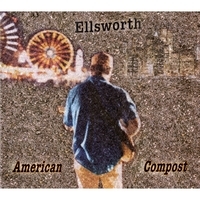 Ellsworth writes great songs, made a terrific acoustic CD (Ask Around) in 1999 with partner Phil Hicks, then went electric on American Compost. (The purists may be hissing but he'll leave em behind and gain a new audience.) He's a gentleman and a troubadour. And, fortunately, he bears little resemblance to Phil Collins. Woah. Didn't realise Ellsworth had such a hugely energetic following. Nice... I think I'll make sure I hang onto the letter he sent me. As for country/not country... if he's not country, then that explains why I like the guy's music so much. Way to go George! I knew it was just a matter of time before someone in the music field appreciated your talent. Now I'm thrilled say I knew you when! Best of luck to a really nice guy!!!! My son & George's son went to the same elementry school.Thru those two kids I met George & his lovely wife. Subsequently George & his musical partner Phil Hicks performed on my Brooklyn based, public access TV show, The Hambone Show. We've been friends since. I play his music on my show. I play his music in my car. I play his music wherever I go. I play his music near and far. I was gonna mooch a free copy of this CD off of George. But, ya know what, I'm gonna buy it. He deserves my support. PS: Listen to Ellsworth & Hicks' CD "Ask Around". Folky, jazzy, country-y, is this a new genre? I just bought American Compost based on your review and I'm lovin' it. Especially the title cut. And the one about "Hey Captain...they're gonna blow us all sky high". The Christmas song is a little bit of a change up on the album but even that's growing on me. It has a kind of John Lennon Imagine message that I like. This is one of the best albums that I've bought in a while.